I recently found out that I will be attending this year’s Marin Symphony Gala at the beginning of next month. Of course, this means that I need to get going on my gown! Sure, I have numerous things in the closet which would certainly be appropriate. However, having made two special dresses for this event the past two years, and not wishing to be outdone by myself, I think something new is in order. I purchased this reproduction of a Ceil Chapman design from The Vintage Fashion Library and later found the perfect fabric - a silk dupioni, cross dyed emerald and black. I have perfected an image of my ultimate version of this dress ever since I laid eyes on the pattern. I cannot be sure that the final product will be everything I hoped for, but I am going to do my very best! Due to space limitations, I have been going through old fashion magazines and pulling the few pages I really want out before recycling the rest. 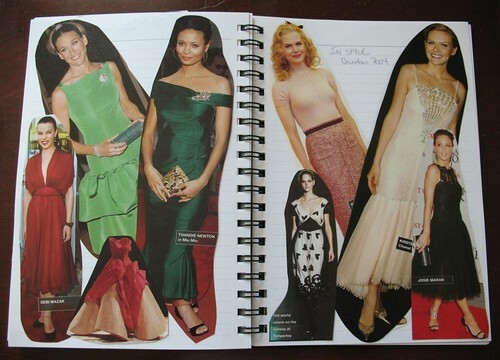 I make little collages out of the tear sheets and note the month, year, and magazine the images came from. And then, because I am obsessed with style.com, I head over to the website to see the entire collection. It is inspiration central! Although it may not be politically correct these days to venerate Mr. Galliano’s artistic genius, I have to say that Dior couture is currently my favorite, perhaps because of the reoccurring use of the New Look silhouette. With less than a month to go, I have traced the pattern onto muslin (the pattern came on bond paper, which just does not like to lay flat, especially with the massively sized pieces involved). I have decided that instead of trying to find a foundation garment that works at the last minute, I am going to make my own attached corselette to help with the added weight of the beading I plan on adding to the bodice. 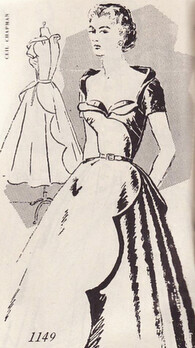 And, of course, I will have to make some sort of headdress (probably a simple 1950s cocktail hat with millinery veiling). I also hope to have enough time to bead or embellish the underskirt a bit. Perhaps something like this . . .
Just to make sure the darn pattern fits correctly, I am going to mock-up the bodice portion in muslin before cutting into my silk. Turns out, I only have scraps of muslin left in my stash. How on earth did that happen? I remember when I first got on the JoAnn Fabrics mailing list and they sent a 50% off coupon, I decided to purchase a 50 yard bolt of 45” wide muslin. I figured that sucker would last forever. Well, I was wrong. I have a lot of work ahead of me, but I think I can do it. Deadlines have a way of motivating me. 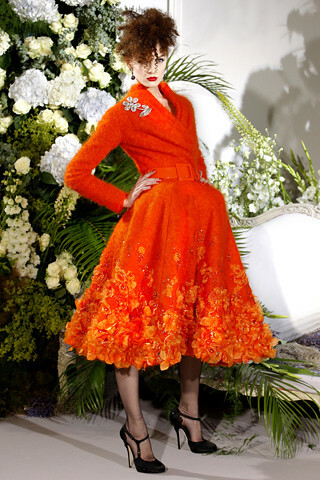 And masses of inspiring images of couture are just a click away! You are a gal after my own heart, only with a much more flattering figure who can wear these beautiful clothes! It's funny to see how many of the pictures you show I have saved in my own files. I bet you are a fan of Charles James, aren't you? Can't wait to see what you come up with! Have fun at the ball, I'll live vicariously through you. Can you post pictures of your previous outfits? I bet they are stunners! I have to post anonymously as I don't have any accounts. @Anonymous Becky - Yes, I absolutely adore Charles James, and Balenciaga, and Dior - well, you get the picture! My Vintage Vogue gown (http://lilacsandlace.blogspot.com/2011/08/vintage-vogue-gown-published.html) was last year's dress, and I have a few pictures over on my flickr account of the blue jacquard dress from 2009 (http://www.flickr.com/photos/45801735@N03/5143879193/in/set-72157625300444890/).